Auto Parts Suppliers Hiring As Fast As They Can During the Great Recession, hundreds of parts makers went bankrupt or slashed their payrolls. But now that Detroit automakers have turned the corner and stepped up their orders, many of their suppliers find themselves short-handed. In some sectors and job markets, the U.S. economy is looking up. Workers build cars on the assembly line at the Ford Motor Co.'s Michigan Assembly Plant in Wayne, Mich., in December. As auto sales boom, parts suppliers are having a tough time finding the labor they need to catch up, having lost workers during the recession. 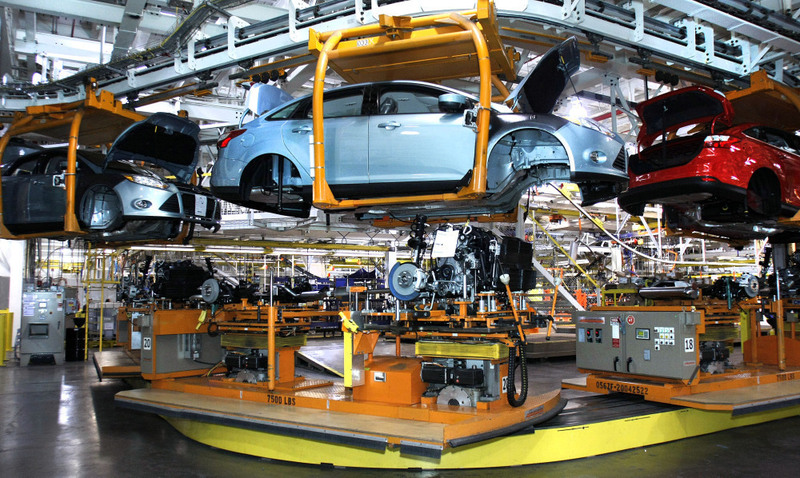 Detroit automakers are creating thousands of new jobs amid a sales boom. And as they expand, their suppliers are racing to keep up, adding tens of thousands of new jobs. At Bridgewater Interiors in Warren, Mich., for example, the pace is intense. Hundreds of union employees scurry to fill a growing list of orders. The factory floor is packed with stacks of foam cushions, seat covers and headrests. Vice President Ron Hall, wearing safety glasses and a bright yellow vest, provides a tour. He points out a large, blinking screen overhead. It's linked to a Ford Motor Co. truck plant. That electronic information enables Ford to tell Bridgewater exactly what kind of seats it needs for each truck moving down the auto company's assembly line 30 miles away. "And so we've got to be able to get that exact configuration and do it in a 3 1/2-hour window, and do it all in sequence," Hall says. This factory was not so busy just a few years ago. During the Great Recession, consumer demand fell so fast and far that people who study the industry had to go back to the World War II era to find another time when, per capita, Americans had bought so few cars. And with two big customers, General Motors and Chrysler, going bankrupt, suppliers were "terrified," said Sean McAlinden, an economist with the Center for Automotive Research. "A lot of them thought they'd go down to one plant, like one heartbeat a minute," he said. In fact, for many, the heart stopped beating. As average revenues plummeted 40 percent in a matter of months, hundreds of suppliers went bankrupt. In many cases, the companies didn't even bother to file for bankruptcy: The owners simply sent their workers home, locked the doors and walked away. Bridgewater Interiors was among those companies that laid off hundreds of their workers. "They actually allowed us to have Fridays off — for no pay," said Darrin Dungy, who has worked at the company that workers call MACI for 11 years. Laurie Cervantes has been there 16 years. She survived the hard times. "Just had to cut out on things that weren't important until things got better," she said. "We just rode out the storm." The outlook is much different now. Bridgewater Interiors has rehired everyone it had laid off. At MACI, workers are sometimes putting in as many as three hours of overtime a day, six days a week. Dungy says he doesn't hear many complaints. "Going through that spell, what I found out on my [assembly] line, is the associates are a little more thankful for what they got," he said. In a dramatic reversal, many suppliers, after improving efficiency — through downsizing and buyouts — find themselves short-handed. At the same time, when it comes to hiring new people, "we're trying to be very careful," said Jerry Kurfess, head of human resources at MACI. With the memory of the Great Recession still so fresh, companies are still wary about hiring too freely. But McAlinden says there actually is a danger of having a shortage of parts and workers. He says the supplier industry will need 174,000 additional workers by 2015, and the pace of hiring right now appears to be too slow. Even when suppliers intend to hire right away, it's not easy. When all those supply companies went dark, many skilled tradesmen, machinists and engineers moved on. Hall, of Bridgewater Interiors, suspects many potential workers are on the sidelines right now, not realizing it's time to get back in the labor pool. "They don't know whether to believe the recovery is real," he said. "We're here living it, and we've been living it long enough now, for two years, that we know that it's real."